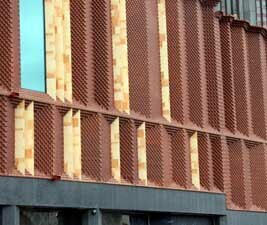 Ketley extruded Staffordshire Red brick slips eliminate the need and cost to cut down bricks for use with pre-fabricated panels and other cladding solutions. They can be used in combination with Ketley class A Staffordshire Red bricks and specials as they are made in the same plant, using the same clay and firing techniques. This offers flexibility to architects and designers to use the most cost effective materials for the project without compromising on appearance or requiring cutting. 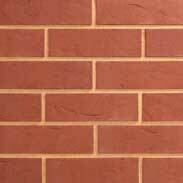 Ketley Brick Slips use only 30% of the embodied carbon of a traditional cut brick. They are a highly durable, sustainable and cost effective choice for construction. 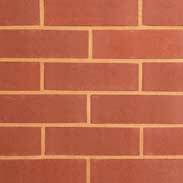 Extruded pistol bricks for corners and returns are also manufactured to complement the range of brick slips, and they are fired alongside the slips to ensure consistancy of colour. Ketley Brick Slips are manufactured from the same clay, using the same processes as the Ketley Class A Engineering bricks and Dreadnought Roof Tiles to deliver the same technical characteristics of very low water absorption, very high strength and unrivalled frost resistance. Banded for fork lift off-loading. A complete range of Special Shapes to BS 4729 2005 is available. We also undertake the manufacture of 'non-standard' specials to customers' specification as required. 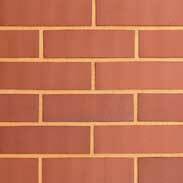 Ketley Brick slips can be mounted in various ways and are suitable for use in external or internal applications. Slips can be incorporated into backing panels either with or without insulation. They can also be used for pre-fabricated arches, bay windows and chimneys. Advice should be sought on the adhesive to be used for fixing brick slips from adhesive and backing panel manufacturers. Sand and cement mortars are not recommended. Please refer to adhesive manufacturer technical services to determine the correct adhesive for the application. Support will be required for the brick slips until the adhesive has set. The thickness of the adhesive will depend on the application and backing substrate, generally the thickness of the adhesive will need to be between 6-12mm. Some systems will require the adhesive to be buttered on the back of the slips, other systems work with the adhesive applied with a gun. Specific advice must be sought from the backing panel manufacturer. Pointing should take place once the adhesive has set. It is also important that both vertical and horizontal movement joints are considered and compressive joints incorporated into the design. For pre-cast concrete panels Ketley brick slips are available with a 4.5mm deep dovetail key in the back to provide additional security to the adhesion of the slip to the concrete panel. The dovetail key will allow the concrete to set within the body of the brick slip providing an additional lock that will bind the slip to the panel.